After their final breaths, the eco set finds a way to become one with the earth. SHOULD YOUR sweet old Aunt Maude request that she be buried upon the day of her expiry, odds are that it won’t be among her prize-winning dahlias. Instead, her body likely will be pumped full of embalming fluid and placed in a wood-and-steel coffin that’s lined with synthetic padding. Once delivered to her final resting place, Maude then will be lowered into a concrete vault, a protective casing that prevents her coffin from collapsing and the cemetery’s perfect green lawn from being marred by unsightly indentations. According to cemetery trade association data, we bury more than one and a half million tons of concrete in U.S. cemeteries every year, as well as 827,000 gallons of body-preserving chemicals—facts that some find to be an increasingly worrisome and ecologically troubling memorial to dearly departed loved ones. Which is why Cynthia Beal, 49, thinks green-minded Americans might be ready to let their bodies be buried ye olde fashioned way—in a biodegradable container that lets the soil do its work. 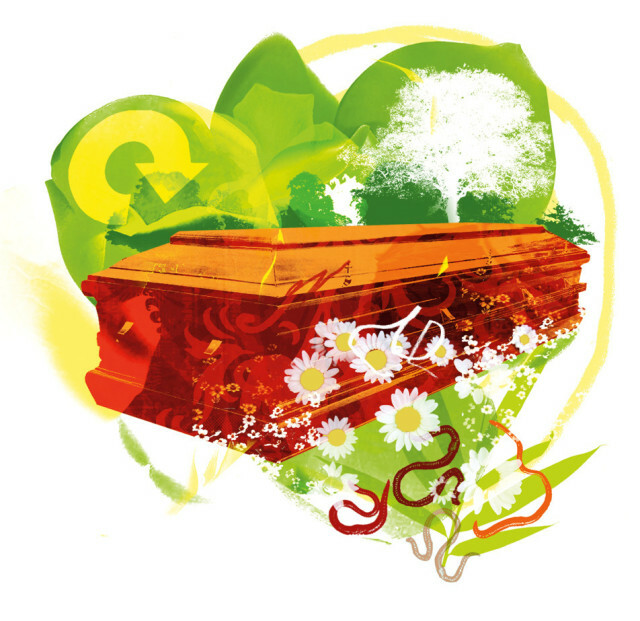 Last fall, in a modest space on N Williams Avenue, just up the street from Pix Pâtisserie, Beal, who formerly owned a natural foods store in Eugene, opened the Natural Burial Company, a dealership for ecological funeral goods—most prominently, coffins. “This one’s mine,” she says, slapping the lid of an Ecopod, a coffin molded papier-mâché-style from recycled newspaper. Unlike a standard box, it’s contoured to the human body and looks like a giant chrysalis. Beal’s company is the exclusive U.S. distributor of the $3,400 Ecopod, which was designed by a British woman who, while caring for a dying friend, was appalled to learn that most coffins available were made from chipboard treated with chemicals that could leach into the ground. But Beal offers other caskets in a range of materials and styles: coffins woven from sea grass or willow boughs, and a simple, chemical-free, plywood box made in Denmark, all of which she’s started selling to funeral homes nationwide. This month, Beal will turn her focus to the retail market, selling direct to the public through her store and her website (www.naturalburialcompany.com), a business move that will make it easier for a person to plan a green funeral well in advance of his earthly exit. True, here in Oregon, 64 percent of the population chooses cremation over interment anyway, a rate surpassed only by Washington, Hawaii, and Nevada. While Beal sells urns made of recycled paper, she wonders: Are people being cremated because they really want to be—or because they don’t like the needless waste of a modern American burial? If burial can be made nontoxic, Beal hopes it might become the new vogue, as it did in the city of Carlisle in the United Kingdom. In 1993, Carlisle opened that country’s very first green cemetery, in which the dead are buried in biodegradable coffins—without the use of a concrete vault—in a wooded landscape that’s allowed to grow wild. So popular was this “woodland burial” model that some 400 former citizens are decomposing there, and more than 200 U.K. cemeteries now allow similar burials. Beal thinks that taking a lead in green burial should come easily to a city that supports green living so strongly. “An unpolluted return to earth should be an extension of that,” she says. In the meantime, her business will continue to help those who wish to give back to the earth one last and final way to do so.